In the United States, a pedestrian is injured every eight minutes and a pedestrian is killed every 2 hours. In Murfreesboro and across Rutherford County, there were 33 reported pedestrian accidents in 2011, 27 pedestrian accidents in 2012, 28 pedestrian accidents in 2013 and 29 pedestrian accidents in 2014 and again in 2015, and in 2016 28 pedestrian accidents were reported. Importantly, these numbers for Rutherford County do not include accidents occurring in parking lots, and parking lots are a large source of pedestrian accidents. Most motorists in a parking lot will become a pedestrian when they leave their vehicle to enter or exit the store, and drivers are often distracted looking for a parking spot, a particular store, etc. Our law firm, with offices in Murfreesboro and Brentwood, have award-winning and nationally-recognized attorneys with decades of experience in helping people who have been injured or lost a loved one in a pedestrian accident. Tennessee law has provisions for pedestrians who are injured in the crosswalk, outside the crosswalk and requirements for drivers when children are nearby. 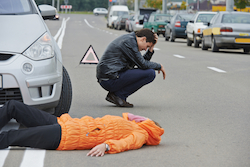 We offer free consultations on accident cases. Yes, it is really free. We will be happy to review your accident and your injuries with you, answer your questions and explain your rights. If we think we can help you, we will handle your case on a contingency basis which means we only get paid if we win. Because we advance all case expenses, you will not have to spend a nickel of your own money to get started. For more information on our fees and how we handle case expenses, click here. If you have a potential pedestrian accident case in Murfreesboro or anywhere in the State of Tennessee, we urge you to act quickly. First, Tennessee law only allows you a limited time to pursue your rights or they are lost forever. For more information on the deadlines for filing a lawsuit in Tennessee, click here. Second, valuable evidence can be lost with the passage of time. For instance, in a pedestrian accident case in a parking lot, the store may have video footage of the accident on their security cameras. But, these cameras are often on a loop so they are overwritten after a set period of time which can often be just days. In addition, documents can be lost, the vehicle involved in the wreck may be repaired, witnesses’ memories may dim – so it is important to have an attorney gathering this evidence for you very soon after the accident. Third, the sooner you get started the sooner you can get the compensation you deserve. We know there are a lot of personal injury lawyers in the Murfreesboro area, and it may be difficult to choose the lawyer that is right for you. We encourage you to review our article on how to select a personal injury lawyer then spend some time reviewing our bios, our awards, our written client testimonials and our video testimonials. What Is My Personal Injury or Death Case Worth? You can reach us anytime by calling our Murfreesboro office at 615-867-9900 or toll-free at 866.812.8787 or simply fill out this online form and we will call you. We would be honored to talk to you and see if we can help.